January 23, 2017, 2:51 PM · It begins with something simple: a child learns a few guitar chords from a visiting relative. Or, he begs for a violin after seeing a show or a video. Or she signs up for the local music program after seeing a friend who could play. When a child takes interest in music -- that is the seed. But whether or not that seed falls on fertile ground is another question. It's is up to parents, teachers, philanthropists and politicians to create the kinds of opportunities that allow children to grow their talents and expand their interests, starting within their own communities. "No one is going to do it for us, we will continue to have to fight for music education," said Johnathan Lipp Saturday at the Grand Rally for Music Education, hosted by the NAMM Foundation at the NAMM Show in Anaheim, Calif. He and his wife, Susan Lipp, were accepting the Don Johnson Industry Service Award for their longtime advocacy for music education, as owners of Full Compass. Among their accomplishments: being a part of the successful effort to have music named as a "Core Academic Subject" in the U.S. Education Act. Those kinds of accomplishments always seem to stand on tenuous ground, as administrations change and education standards come under revision. But what is important is to continue promoting a truth that is not self-evident to everyone: That music is a crucial component of education. While music education is important for its own sake, it also brings about better skills in math, in critical thinking, in communication, in teamwork...the list goes on. Any person's success in music can be traced back to that first germ of interest, and then to the teachers and opportunities that allowed that interest to flower into real music-making. This was something that NAMM Foundation executive director Mary Luehrsen drove home again and again Saturday, as she interviewed successful musicians ranging from students to professionals: middle and high school musicians from The Perfect Fourth Quartet, Turnaround Artists Keb' Mo' and Bernie Williams, and Black Violin musicians Kevin Sylvester and Wilner Baptiste. For the youngest performers at the Rally, Maxwell, Aidan, Peirce and Nick of The Perfect Fourth Quartet, their music-making began completely apart from each other. They are from all over the United States: Cincinnati, Chicago, Philadelphia and Oakland, Calif.. The magic moment that brought them together as a quartet came through the Sphinx Performance Academy summer camp. "We felt a connection when we started playing together," said Nick, the cellist. Since then, they've had some impressive opportunities, including performing at the White House for a crowd that included Michelle Obama. Musicians Keb' Mo'and Bernie Williams (of Yankees fame) spoke at the Rally about their work in inner-city schools, mentoring for Turnaround Arts. When asked what he does with the kids at the Chicago school where he mentors, Keb' Mo' put it very simply: "I show up." He encouraged people to show up for their own kids, show up for other people's kids, and to keep showing up to make music education happen. The Rally concluded with a performance by Black Violin, featuring two musicians who met back in middle school, violinist Kevin Sylvester and violist Wilner Baptiste. Kev said that people used to ask him why he wasn't playing football, and he said that he was always interested in the vast potential the violin presented to him. "It was a way to chance people's perceptions about what this instrument could do, and who could play this instrument," he said. Both he and Wil are classically trained, with degrees in music, and "we wanted to take what we learned in classical music and apply it to what we learned in our culture." 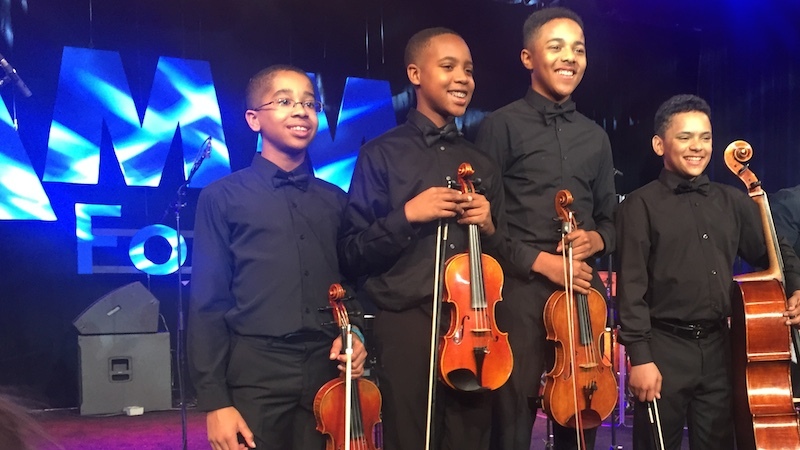 At the end of the Rally, the four young musicians in the quartet joined Black Violin to play their version of "Simple Gifts." It was obvious from the smiles on stage, they were all greatly enjoying their own gifts, as well as the gift that is music. January 26, 2017 at 10:25 AM · Thanks for this! Three of the boys are in middle school, two in 7th and one in 8th. Nick is in 10th. January 27, 2017 at 03:28 AM · Thanks, yes, even younger than high school, you are correct! I've added Oakland as well, they weren't specific about where in CA!